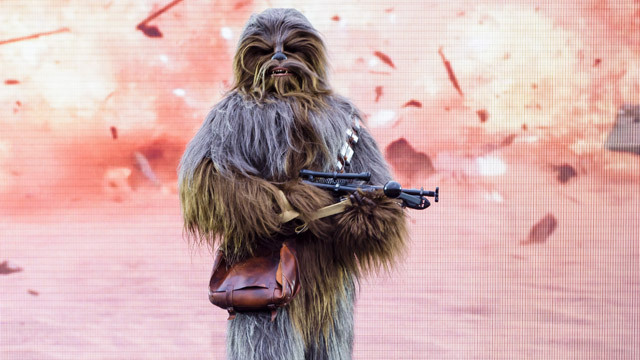 Forty years after Luke Skywalker and an unforgettable cast of heroes, heroines and highly-strung droids revolutionised cinema, Disneyland Paris launched a galactic new celebration - unique in the whole of Europe. And now it's back. An exclusive nighttime spectacular leads the events, which unusually take over Walt Disney Studios Park rather than Disneyland Paris' original park. Star Wars: A Galactic Celebration features an epic battle and memorable moments from the legendary movies brought to life with projections, special effects and even live characters at the heart of the park, turning the impressive Hollywood Tower Hotel into a projection surface for flying X-Wings, TIE fighters and more. The chance to see such a large number of Star Wars characters coming to life is a unique Season of the Force selling point, many of them only rarely seen at Disneyland Paris and some never seen here before at all. Each day, the new stage celebration Star Wars: A Galaxy Far, Far Away takes place on a new outdoor stage, bringing together an incredible roster of characters from both the "dark side" and the light. 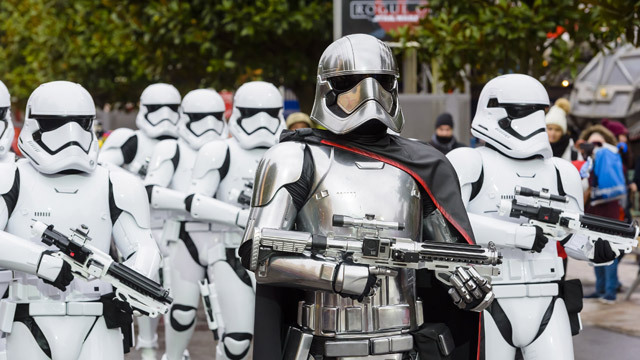 In between, the First Order March sees Captain Phasma rule over the park with a procession of Stormtroopers, who also make sporadic visits throughout the day. Selfie with a Stormtrooper anyone? If you grew up wielding a lightsaber to the original trilogy, now it's time to pass on that unique feeling of the force to your next generation — or just relive it for yourself. You won't find an experience like it this side of Tatooine — or North America. At long last, the force is awakening not so far, far away. Plan your Disneyland Paris trip to live the brand new Season of the Force for yourself, a new Star Wars experience unique in the whole of Europe. Book your adventure to the place where Star Wars lives now to choose from the best availability before the New Year rush. When darkness falls, the park lights up in a spectacular show of Star Wars colours, lights, sounds and special effects! For the first time in its history last year, Walt Disney Studios Park gained a daily nighttime spectacular. Using the familiar projection-mapping techniques of the neighbouring Disney Dreams! and taking cues from a similar nighttime show in Florida, this Galactic Celebration was specially designed for Disneyland Paris. 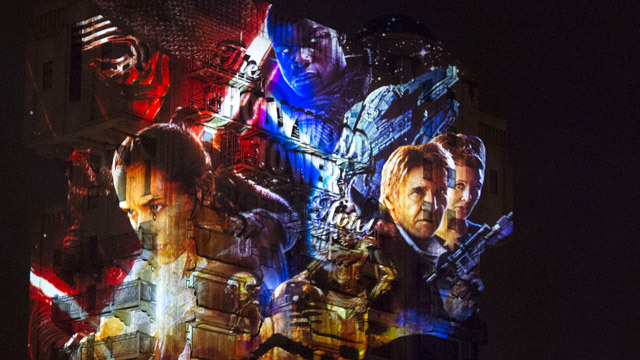 No less than 16 high definition projectors use the huge 2,500m² surface of The Twilight Zone Tower of Terror as a canvas to bring key moments from the saga to life. As X-Wing and TIE starfighters swoop past, you're plunged into the middle of an epic Star Wars battle scene. AT-ACT and U-Wings from Rogue One: A Star Wars Story are featured and Disneyland Paris has even confirmed new visuals will even reference the brand new movie instalment, Star Wars: The Last Jedi. More unusually for a nighttime projection show, the 2017 event featured a number of live characters including Chewbacca, R2-D2, Kylo Ren and Darth Vader. Happening only during Season of the Force, this unique, limited-time event is the absolute highlight of the season. Relive some of the greatest moments from a long time ago in a galaxy far, far away for real. On a new outdoor stage at the heart of Walt Disney Studios Park, a great cast of Star Wars characters come together like never before at Disneyland Paris. Based on an event of the same name at Disney's Hollywood Studios in Florida, classic clips are interspersed with brief appearances from the likes of C-3PO, R2-D2, Darth Maul, Chewbacca, Captain Phasma, Kylo Ren and of course Darth Vader. Don't expect any kind of storyline worthy of the space opera, but do soak in the chance to feel that this galaxy of stories is alive in front of you. 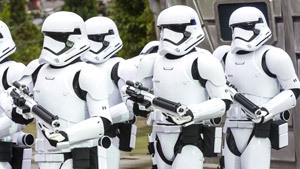 A force of Stormtroopers are led into the park at the command of Captain Phasma. Clad in a distinctive armour of salvaged chromium, Captain Phasma commands the First Order's legions of stormtroopers in their battle against the New Republic. Certainly one the more unusual Disney processions, the battalion of Stormtroopers march into the park "on the authority of General Hux", eventually lining up around the stage to signal the start of Star Wars: A Galaxy Far, Far Away. Disneyland Paris opened Space Mountain: De la Terre à la Lune in 1995 with the greatest storyline of all its worldwide cousins. But as of 2017, the mighty Columbiad Cannon resting on the side of the mountain doesn't blasting us into a Jules Verne fantasy but a galaxy far, far away. Feel the force of Star Wars at Disneyland Paris with our YouTube playlist of Season of the Force teasers and trailers. Thrilling nighttime spectacular, attractions and character events. Face up to the ground force of the Galactic Empire and First Order as they patrol the park checking guests' credentials throughout the day. Just don't question their height — these Stormtroopers are the real deal! For the best Star Wars merchandise range at Disneyland Paris, the bustling Star Traders at the exit of Star Tours is the place to go. 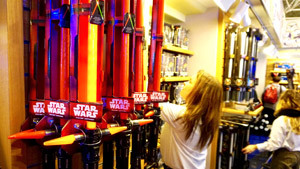 But for a quieter place to shop, head to Disney Store in Disney Village which also features Droid Factory and Build Your Own Lightsaber. It's true... all of it. Jedi Burgers and Yoda Cupcakes are a real thing and can be found at Café Hyperion inside Videopolis. For an extra Star Wars easter egg, make sure you see the breathtaking Disney Illuminations nighttime spectacular, using lasers, projections and special effects to bring the universe to life on Sleeping Beauty Castle itself. Board the massively upgraded Star Tours: The Adventures Continue and you can now experience a brand new flight to the planet of Crait, featured in Star Wars: The Last Jedi. Can't make it to Disneyland Paris this winter? Although the shows and especially the nighttime spectacular are seasonal, the permanent Star Wars attractions are available all year. 1977 — Star Wars: Episode IV A New Hope released. 1979 — Disney releases The Black Hole, a sci-fi picture it hopes can replicate Lucas' success - it fails. 1984 — The Adventures of André and Wally B, a computer-animated short film, is produced by a division of Lucasfilm which would later be spun-off to become Pixar Animation Studios. 1984 — Disney and Lucasfilm team for their first significant creation, Captain EO - a 3-D, musical sci-fi film for Disney parks starring Michael Jackson. 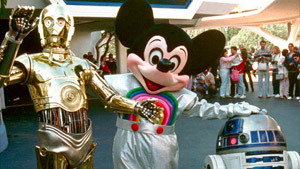 1987 — Star Tours opens at Disneyland in California and is an opening day attraction at Euro Disneyland in 1992. 2011 — Star Tours - The Adventures Continue debuts at the American parks. It opens at Disneyland Paris in 2017. 2012 — The Walt Disney Company buys Lucasfilm in a $4.06 billion deal. 2015 — Star Wars: The Force Awakens is released, followed by spinoff Rogue One: A Star Wars Story in 2016. Pre-book 1 Day Tickets to SaveSave time and money, enjoy more of the magic while you're there.